Exclusive! New Knight Rider Comic Artwork and Press Release! Here at the Knight Rider Archives we have been given a sneak peek at some of the artwork we are going to be treated to for the new Knight Rider comics thanks to Lion Forge Comics and Wonacott Communications. We hope you enjoy the teaser! The comics are set to be released sometime in October or November this year according to the latest reports. They will be available on Amazon Kindle Bookstore, Apple iBooks, Barnes & Noble’s The Nook Book Store and Kobo. We have also been allowed access to the original press release giving details of the new comics set for release later this year. Once again a huge thanks to Lion Forge Comics and Wonacott Communications LLC for allowing us access to this information. LOS ANGELES and ST. LOUIS – July 2, 2013 – NBCUniversal, one of the world’s premier media and entertainment companies, has partnered with digital publisher Lion Forge Comics to develop licensed comic books based on popular TV shows from the 1980s and 90s. Well-known writers currently signed on to work on the projects include: Joelle Sellner (Teen Titans, Jackie Chan Adventures, Hi Hi Puffy AmiYumi); Jonathan London (Geekscape); Geoffrey Thorne (Leverage, Ben 10) and David Gorden (Catalyst Prime: Accel and Catalyst Prime: Quincredible). Currently, Jason Johnson (Wetworks, Godstorm) and Lion Forge’s own Carl Reed and Lorenzo Lizana are on board as artists. The comics are planned for distribution in Q3 and Q4 2013, and will be available through the Amazon Kindle Bookstore, Apple iBooks, Barnes & Noble’s The Nook Book Store and Kobo. Lion Forge executives will participate on a panel at Comic-Con International: San Diego from 6:30 – 7:30 p.m. PDT on Saturday, July 20, in Room: 26AB (SDCC), where they will discuss these and other properties in development. Lion Forge is a St. Louis-based transmedia studio with a focus on digital publishing. With both original and licensed titles, Lion Forge brings together the brightest talent to acquire and develop content and character franchises within the comic book, television, film and interactive gaming industries. Lion Forge applies cinematic elements to each property to create compelling, story-driven experiences from start to finish, bringing unique entertainment experiences to both traditional and digital marketplaces. For more information, please visit www.lionforge.com or the Lion Forge Facebook and Twitter pages. 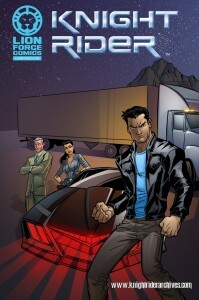 This entry was posted in Knight Rider, Merchandise and tagged comic, Lion Forge. Bookmark the permalink.